In an interview granted to T3 and published on Tuesday hours before the iMac Pro availability announcement, Schiller called Face ID "the boldest of the things we've done" and reiterating the Apple committed to the new technology early in the process. "That's an exciting moment, when you have to sort of the old saying: Burn the boats. Leave the past behind, and commit'," said Schiller. "Knowing that the team was willing to make that gamble was a key point early enough in the process." As far as the Face ID technology included in other products, Schiller danced around the subject. "We try not to get ahead of ourselves," Schiller said to T3. "While we have many plans throughout the year for many things, we also are realists in that we need to create something, and that we need to make it great, and that we need to study, and we need to learn all the user cases all around the world from everybody in every situation, before we then imagine some of the other things we might do." Schiller also has seen that the new gestures on the iPhone X made necessary by the omission of a home button have been easy for users to adapt to. "Most people are comfortable with it within minutes - 30 minutes, whatever. It's not the kind of thing you have to live with for a week or two to get used to," said Schiller. "That, to me, is always the sign of some or our most advanced, best thought-out technology: they become intuitive incredibly quickly and change how you think about everything else you use." Apple's deep integration between its assorted technologies is often cited as a reason for sticking with the ecosystem. Pointing to the Apple Watch being able to unlock a Mac, AirPods, and the Apple Pencil as examples, Schiller sees Apple CEO Tim Cook at the core of those interactions. 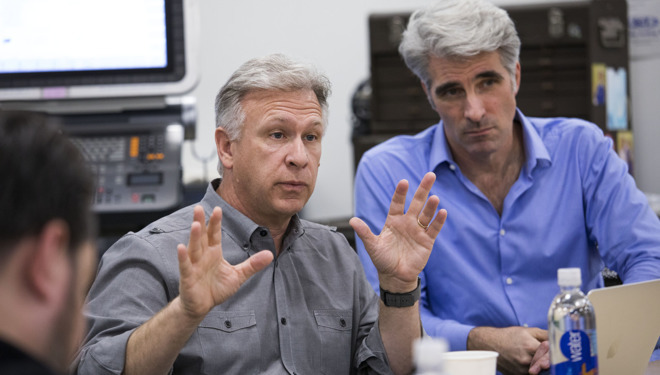 "One of the great things Tim has done is to recognize the power of collaborative work at Apple; he encourages us all to really take advantage of that; and to not only work together, but to imagine things in our products that would not be possible had it not been for that collaboration," said Schiller about Cook. "And those then turn into strengths that, as customers, we all benefit from." Schiller spoke at length about the engineering process for the AirPods. Saying that the company first had the Apple Watch Series 3 in mind when they conceived the device, the executive spoke about problems that they ran into along the way. "At the surface level, it's an incredibly simple product. But the reality is it's actually an incredibly complex product to make," Schiller said regarding the very popular wireless earbud released in the end of 2016. "Each AirPod really is its own computer, running software and hardware. And those two computers need to deliver this very clear experience that you want, and they have to work together, because we're very attuned to synchronization in audio as a species." Issues cited along the way were the unexpected result that removing the cable had on bud retention in the ears, dealing with RF shielding by the human body itself, and other fit and finish issues. Schiller claims that Apple "learned over the last few years" the "depth and love" that the Mac platform has by pro users. He says that the definition of Pro is very wide, and is very difficult to accommodate in full —but they are listening. "So why now? Because this is how long it's taken. It was a big, big project, and that's just how things go. It takes this time. And we're getting close to when it's out there. It's very soon. A matter of days now." Schiller said. "And like all of our products, we have a lot of thoughts and feelings about it, but the truth will be: what do customers tell us? I can't wait." "It's really very simple. It's a brand new product. It's a lot of engineering to make it be the product we've described, and for it to be what we all hope it can be." Schiller said about the HomePod's delay into 2018. "I'm actually really proud that we're a company that will take the time to do something right. Our goal is always not to be most' but to be best', and we set high standards. We often exceed those, but not always. And we need to be self-honest if something's not ready, and continue to work on it until it is."